To start with, one can mix his or her very own body wash, facial wash or hand wash. Just mix a few drops of CDL Naturals Aromatics (our essential oils) to about 100mL of CDL Naturals Unscented Castile Soap and you got scented soap already! Dilute this with distilled water, it can be used as a facial or hand wash. Hope you won't mind using it thin and watery. 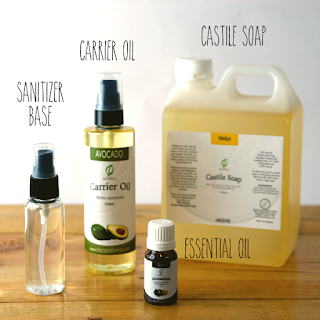 Make massage oils or body oils by putting several drops of essential oils to carrier oils. You can also combine other massage oils to create your very own mix fit for your skin type. Try making facial serum as well by adding essential oils to carrier oils beneficial for facial rejuvenation and applying it during the night. How about making your very own sanitizer with a smell you created? That's why we're providing an unscented sanitizer base where you can just add essential oils, shake and use. Please use weighing scales if accuracy is desired. Percentages is better calculated by weight than volume. However, you can always go by volume or drops. Just please be aware it isn't very reliable. 1mL is usually equivalent to 20 drops. Soaps: 1-3%. Too much may be too overwhelming. Sometimes you can go as low as 0.5% on many essential oils. Carrier Oils: 0.25%-2%. This concentration is usually enough to achieve desired effects and is already quite fragrant for neutral smelling carrier oils. Sanitizer: 0.25%-1%. Going over this limit may cause cloudiness for most essential oils (Ylang-ylang, Lemongrass, Rosemary, etc. ), although some essential oils can be added up to 5% without any issues. Please note as well that some essential oils when blended with our sanitizer base will go a bit cloudy at first, but will clarify after a day or two. *All our unscented products will definitely work with CDL Naturals Essential Oils provided recommended limits are observed. You may use other essential oil brands but we cannot guarantee results as they haven't been tested. *Please note that our essential oils are subject to availability. You'll be advised if the EO requested is not available so please provide your contact details we can use.